If you have been a music lover ever since you were a kid, then you might have always been seeking out for better sounding speakers. With one set of speakers, vocals would be more or less prominent while with a different set of speakers bass lines would come to life. Here is the speaker that has it all. The Logitech Z506 speaker system is unbeatable in terms of the features provided by it. The surround sound quality offered by the speaker system is great for sitting back in your couch and simply enjoying some great visuals on your desktop or just enjoying the powerful audio. Here is the Logitech Z506 review which will help you in deciding whether or not you should invest in this great system of utility. The Logitech Z506 speaker system provides a powerful output having a power range of around 75 Watts RMS and also has a subwoofer power output of 26 Watts. It not only has a center-channel speaker but it also contains 4 satellite-speakers that combine together to produce a moving and strong sound quality. The ported and down-firing sub-woofer delivers exceptional bass tones. Moreover the speakers also have 3D stereo sound surround quality that will give you an altogether different feel. You can as well modify your listening experience by simply tuning the bass levels with the help of a dedicated bass-controller. • The speaker system is very easy to setup manually, a person simply need to follow the color code and it will be done quickly. • The sound quality is assuredly great when compared to any other 5.1 system. The bass effect of the subwoofer is a major thumbs-up in this system for it provides the effect without any kind of distortion. • Moreover the porting down feature of the subwoofer provides an exceptional sound experience even at levels greater than 50 Watts. • Unlike other tweeted speaker systems, the Logitech Z506 keeps in mind to provide sound quality without any warps. • It also has a 3.5 mm AUX input along with a headphone output which is customary in every speaker these days. Usually customers complain of wires being short that are provided along with the speakers. There are no remote controls provided along with the speakers but the controls on the speakers are quite operational and functional to fulfill all your needs. Compared to the number of features it provides, the cons are really insignificant. Final Verdict – Why one should buy these speakers? If you want a speaker system to be fitted in your room, then these speakers are just great to be invested upon. The Logitech Z506 speaker system offers a wide range of exceptional features at affordable prices. Moreover, these speakers are also great for being used with your gaming console to be contented with the ultimate experience. It is very important that you should ensure that the system you are going to connect these speakers to have the essentials. 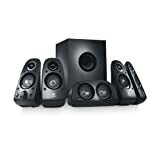 It must have drivers and audio jacks that will support a set of six speakers. If it has, you can simply relax and enjoy the soothing music. After reading the entire review about the speakers, you do not need to be dicey whether you should purchase these or not. These speakers are simply a great find in the price range it is available.